 (1Timothy 1:3, 19-20). Who concerning the truth have erred, saying that the resurrection is past already; and overthrow the faith of some (2Timothy 2:18). 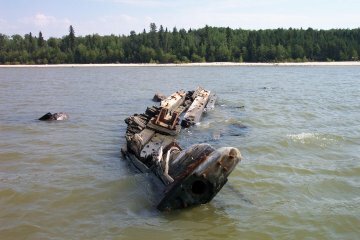 On a beautiful day in the latter end of summer we went for a cruise around Black Island, but this year Lake Winnipeg was lower than it had been since the 60's. Lower rainfall in the region had caused the lake to drop close to 3 feet. The north side of Black Island we knew to be strewn with rocks so in that area we had to slow down as a precaution. As we were going through a narrow passage, all of a sudden, bump, bump. We glanced off a few small rocks but sustained no damage due to the fact we were almost idling. This frightened my young daughter, and she wanted us to assure her we were not taking on any water. As we continued on we could see an unfamiliar sight in the distance. In years gone by, when the water was much higher, we had not noticed this object before. The day was beautiful and the lake was calm so we decided to venture a little closer to investigate. A long way off though, the waters were getting quite shallow, so I ventured to jump in the water and tow the boat by hand towards this unusual protrusion in the waters. As we approached our mysterious object, it became clear that there lay the ruins of an old wooden ship wedged among several large rocks. During normal water levels these rocks would have been hidden just beneath the surface of the water, lying in wait for any unsuspecting sojourner. We have no history on this ship. How did it get there? The passengers we know not. Did they die? Did they survive? All we know is that their vessel now lay SHIPWRECKED, abandoned and forgotten, with not much left of the hull. What a tragedy for such a grand vessel. Could the crew have done anything to avoid this disaster? Many storms in life can rise up with very little warning, so the common seafarer was always prepared knowing that the seas can be beautiful and serene, but also a dangerous place to get caught unawares. His eyes were trained to watch the horizon for any storm fronts that might be blowing in. His nautical charts are a precious tool. By these he is made well aware of places he should stay away from, and those harbors that can be a refuge from the storm. If by chance he finds himself in uncharted waters he proceeds very cautiously and begins to plumb the depths of the waters. Usually the captain of the ship has logged many hours on the sea. He knows how to maintain his vessel. He is a man of experience and integrity. His mates have respect for him and are ready to obey his voice according to all his commands. Their response is quick knowing that the state of the whole ship depends on his keen foresight, and amazingly enough, their own obedience to his commands. They have placed their trust and faith in his abilities to direct the ship thorough calm and stormy seas. Perhaps in some way this is similar to the faith that we find in the Bible. We are all pilgrims and sojourners just passing through this foreign land. But we have one who has traveled this path before. His name is Jesus Christ and He is the captain (Hebrews 2:10) of our salvation. He is faithful and true. His Word is absolutely trustworthy for He cannot lie (Titus 1:2) and all the promises of God in him are yea, and in him Amen (2 Corinthians 1:20). for instruction (2 Timothy 3:16). 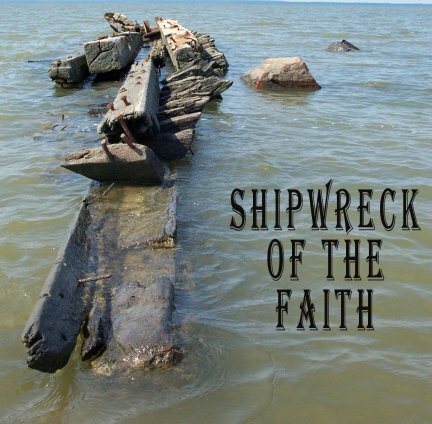 Attending to it is absolutely necessary, and without faith in His Word there is the real possibility of making shipwreck as the apostle Paul has said, some having put away concerning faith have made shipwreck (1Timothy 1:19). The problem was not with the captain , but that they had put away faith in His Word. When someone puts away his faith in the captain, and turns from his commandment, on the high seas, it is called mutiny. This can be a terrible thing, but Paul, in our text, calls it blasphemy (1Timothy 1:20) for they despised the good Word of the Captain. How did some make shipwreck? What is it then, that causes those who have appeared to be walking in the faith to make shipwreck? Perhaps a terrible storm caught them off guard blowing them off course and onto the rocks. Perhaps the beautiful shores of this world mesmerized them and the lust of their eyes drew them into these dangerous waters. The captain having traveled this route before would have known the dangers that lay ahead and would have commanded the crew to stay on course turning neither to the left nor to the right. who overthrow [subvert] the faith of some (2Timothy 2:16, 18). These had turned from the Truth unto fables, Who concerning the truth have erred, saying that the resurrection is past already  (2Timothy 2:18), ignoring the teachings of Jesus (John 5:25-29) and the apostle Paul (1Thessalonians 4:16-17) who taught a future bodily resurrection. These were among many Whose mouths must be stopped, who subvert [overthrow] whole houses [church fellowships] , teaching things which they ought not, for filthy lucre's sake (Titus 1:11). So Paul instructed Timothy to keep that which is committed to thy trust, avoiding profane and vain babblings , and oppositions of science falsely so called: Which some professing [believers] have erred concerning the faith  (1 Timothy 6:20-21). Never set sail with these for they are sure to make shipwreck, and when their ship goes down all that be with them shall likewise perish. [and] the pollutions of the world through the knowledge of the Lord and Saviour Jesus Christ (2Peter 2:18, 20), but knowledge alone is insufficient for salvation. They must receive Jesus Christ as personal Saviour in true repentance and faith. They had known the way of righteousness but in the end they turn [ed] from the holy commandment delivered unto them (v. 21), fulfilling the proverb The dog is turned to his own vomit again; and the sow that was washed to her wallowing in the mire (v. 22). How did they make shipwreck? They turn [ed] from the holy commandment delivered unto them , giving heed seducing spirits (1Timothy 4:1). These false teachers (2Peter 2:1) lured them through covetousness (v. 3), through the lust of the flesh, [and] through much wantonness (v. 18). And they who are led astray are not a few, for many Peter says, shall follow their pernicious ways (v. 2). It must be made clear right here and now that these may have had a form of godliness (2Timothy 3:5), but they were never saved. They may have went to church on Sunday, they may have attended a Bible Study, they may have been baptized, they may have made a commitment at one time or another to the Lord, but they never knew the voice of the Good Shepherd. And a stranger will they not follow , but will flee from him: for they know not the voice of strangers (John 10:27, 5). The Good Shepherd says of His sheep they can never be lost. And I give unto them eternal life; and they shall never perish, neither shall any man pluck them out of my hand (v. 28). So those who in the end make shipwreck never had eternal life abiding in them. It is their lusts that drew them away from the holy commandment. In fact, Jesus said the cares of this world, and the deceitfulness of riches, and the lusts of other things entering in, choke the word  (Mark 4:19). Their affections were preoccupied with the cares and riches and pleasures of this life (Luke 8:14) rather than on things above (Colossians 3:1-2). heap to themselves teachers , having itching ears; And they shall turn away their ears from the truth  (2Timothy 4:3-4). Peter says, that there shall come in the last days scoffers, walking after their own lusts , And saying, Where is the promise of his coming (2Peter 3:3-4)? It is their own lusts that have turned them away and very quickly they begin to doubt and then criticize the very Word of God. The way of the ungodly is outlined and contrasted with that of the believer in Psalm 1:1, Blessed is the man that walketh not in the counsel of the ungodly, nor standeth in the way of sinners, nor sitteth in the seat of the scornful. First, the weary soul begins to hearken to the counsel of the ungodly , then he would begin to associate himself with the way of sinners , and finally he would settle down in the seat of the scornful . From such turn away (2Timothy 3:5). Turned from the holy commandment. Gave heed to false teachers. We also have seen that these were not truly born again. They were not saved. They never really knew the voice of the Shepherd or they would have followed Him and fled from the voice of these blind guides. So FIRST , if any man wants to avoid shipwreck we must Examine yourselves, whether ye be in the faith; prove your own selves. Know ye not your own selves, how that Jesus Christ is in you, except ye be reprobates (2 Corinthians 13:5)? If you have never repent (Luke 13:3) and believed the gospel (1Corinthians 15:1-4), and by faith received Jesus (John 1:12) as your Saviour from sin you are lost, you are yet reprobate concerning the faith. It does not matter how religious you are, if you go to church, if you are not that bad or try to do the best you can. The fact of the matter is that you have broken God's holy commandments (Exodus 20) and the payment for sin is death (eternal separation from God in Hell). Sin cannot be paid for with money, or good deeds. Death is the wages of sin (Romans 6:23) and that's the Law! Jesus told Nicodemus Ye must be born again or else he could not see nor enter the kingdom of God (John 3:1-8). Nicodemus did not quite understand this saying, as many today, so Jesus told him as Moses lifted up the serpent in the wilderness, even so must the Son of man be lifted up: That whosoever believeth in him should not perish, but have eternal life (John 3:14-15). Nicodemus was a Pharisee and would have known this event from the Old Testament Scriptures. 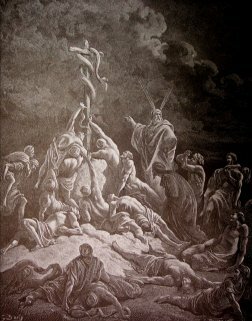 When Israel was wandering in the wilderness on the way to the Promised Land, they began to grumble and speak against God and Moses, so the Lord sent fiery serpents, and they bit the people and many people of Israel died. But then the people acknowledged their sin and asked Moses to intercede for them. And the LORD said unto Moses, Make thee a fiery serpent, and set it upon a pole : [Heb. nec ] and it shall come to pass, that every one that is bitten, when he looketh upon it, shall live . And Moses made a serpent of brass, and put it upon a pole , [Heb. nec ] and it came to pass, that if a serpent had bitten any man, when he beheld the serpent of brass, he lived (Numbers 21:8-9). even so must the Son of man be lifted up . He said, And I, if I be lifted up from the earth, will draw all men unto me. This he said, signifying what death he should die (John 12:32-33). The Bible tells us He that committeth sin is of the devil; for the devil sinneth from the beginning. For this purpose the Son of God was manifested, that he might destroy the works of the devil  (1 John 3:8). The Word was made flesh that through death he might destroy him that had the power of death, that is, the devil  (Hebrews 2:14) fulfilling the ancient prophecy that says Christ shall bruise thy [the devil] head, and thou shalt bruise His heel (Genesis 3:15). The Devil was the author of sin, which brought death into the world, and so he was a murderer from the beginning (John 8:44). He had the power of death and the sting of death is sin (1Corinthians 15:56). 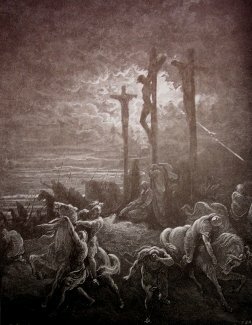 But Jesus came to destroy the works of the devil as represented by the impaled serpent on a pole. He came to save us from the sting of death, which is sin. When Jesus was lifted up on the cross He was made to be sin for us, who knew no sin; that we might be made the righteousness of God in him (2 Corinthians 5:21). It was on Calvary's cross that Jesus was lifted up high on a pole whereby He would draw all men , that whosoever should believe in Him should not perish but have everlasting life. It was on the cross that Christ died for our sins. He bare our sins in his own body on the tree (1 Peter 2:24). He was wounded for our transgressions, he was bruised for our iniquities (Isaiah 53:5). Through death, Jesus destroyed the works of the devil when He rose triumphantly over the grave conquering sin and death. He was delivered for our offences, and was raised again for our justification (Romans 4:25). We now have a lively hope by the resurrection of Jesus Christ from the dead (1Peter 1:3). When we look to Jesus, putting our faith alone in His substitutionary death for our sins, the deadly sting of the serpent is healed and we are given everlasting life. SECONDLY , once we are saved we now begin our Christian pilgrimage. We are no longer children of darkness and are encouraged to walk in the light of God's Word (John 8:12). As ye have therefore received Christ Jesus the Lord, so walk ye in him (Colossians 2:6). We have received Jesus Christ by faith and now we walk by faith, not by sight (2 Corinthians 5:7). Our character and desire should now be to walk according to the Word of God and not after the lust of our eyes. Those who were lured away from the faith were led away by the lusts of their flesh. But once we are saved, the Spirit of Christ dwells in us, enabling us, if we make a conscious effort, to walk in the Spirit. Walk in the Spirit, and ye shall not fulfil the lust of the flesh. For the flesh lusteth against the Spirit, and the Spirit against the flesh: and these are contrary the one to the other: so that ye cannot do the things that ye would. But if ye be led of the Spirit, ye are not under the law (Galatians 5:16-18). abstain from fleshly lusts, which war against the soul (1Peter 2:11). Paul tells us to flee from youthful lusts (2 Timothy 2:22) and make not provision for the flesh, to fulfil the lusts thereof (Romans 13:14). Paul describes some of the lusts of the flesh and makes it clear that those who walk in such sins are not saved. Now the works of the flesh are manifest, which are these; Adultery, fornication, uncleanness, lasciviousness, Idolatry, witchcraft, hatred, variance, emulations, wrath, strife, seditions, heresies, Envyings, murders, drunkenness, revellings, and such like : of the which I tell you before, as I have also told you in time past, that they which do such things shall not inherit the kingdom of God  (Galatians 5:19-21).  Be not deceived : neither fornicators, nor idolaters, nor adulterers, nor effeminate, nor abusers of themselves with mankind, Nor thieves, nor covetous, nor drunkards, nor revilers, nor extortioners, shall inherit the kingdom of God (1Corinthians 6:9-10). But the fearful, and unbelieving, and the abominable, and murderers, and whoremongers, and sorcerers, and idolaters, and all liars, shall have their part in the lake which burneth with fire and brimstone: which is the second death (Revelation 21:8). that they which live should not henceforth live unto themselves, but unto him which died for them, and rose again (2Corinthians 5:14-15). Those who do such things, that is, habitually do such things, thereby indicate they are not really led by the Spirit and therefore not really saved. Jesus said, The wind bloweth where it listeth, and thou hearest the sound thereof, but canst not tell whence it cometh, and whither it goeth: so is every one that is born of the Spirit (John 3:8). In other words, we should be able to see the effects of the Spirit working in the believer's life. As the wind blows on a ship and it lists in a certain direction, so they who are born of the Spirit lean toward the sound of His voice and away from sin. We must understand however, that the believer may occasionally stumble, but he will not habitually practice sin, and when he sins he confesses it to the Lord in prayer. If we say that we have no sin, we deceive ourselves, and the truth is not in us. If we confess our sins, he is faithful and just to forgive us our sins, and to cleanse us from all unrighteousness. If we say that we have not sinned, we make him a liar, and his word is not in us (1John 1:8-10). Jesus illustrated this when He washed the disciples feet. Peter at the first said, Thou shalt never wash [Gr. nipto] my feet. Jesus answered him, If I wash [Gr. nipto] thee not, thou hast no part with me. Simon Peter saith unto him, Lord, not my feet only, but also my hands and my head. Jesus saith to him, He that is washed [Gr. louo: bathed; saved] needeth not save to wash [Gr. nipto] his feet, but is clean every whit (John 13:8-10). When a man repents and believes the gospel , receiving Jesus Christ as Lord and Saviour, his sins are washed [Gr. louo] in the blood of the Lamb. He is clean every whit. He is made fit for heaven and needs never to bath again. This is the same word used in Revelation 1:5, Unto him that loved us, and washed [Gr. louo] us from our sins in his own blood , and it is also the same word that is used for washing of one who was dead (Dorcas) and made alive (Acts 9:37). As a pilgrim on this earth though, the dusty roads in life tend to soil our feet so we need to place them in the palm of the Saviour for cleansing. When we dirty our feet, salvation is not lost, but fellowship is broken, and restoration comes only by confessing our sins. Notice Jesus said, If I wash thee not [your feet]	, thou hast no part with me , not in me. Salvation in Christ is not lost but fellowship with Him is broken. If we say that we have fellowship with him, and walk in darkness, we lie, and do not the truth: But if we walk in the light, as he is in the light, we have fellowship one with another, and the blood of Jesus Christ his Son cleanseth us from all sin (1John 1:6-7). THIRDLY , as Paul, we need to warn the flock of false teachers and their doctrines that they might stand fast in the faith (1Corinthians 16:13). A great portion of Paul's ministry was that of warning against false doctrine and false teachers. For I know this, that after my departing shall grievous wolves enter in among you, not sparing the flock. Also of your own selves shall men arise, speaking perverse things, to draw away disciples after them. Therefore watch, and remember, that by the space of three years I ceased not to warn every one night and day with tears  (Acts 20:31). When one fails to warn the souls of men concerning the unfruitful works of darkness and begins to express fellowship with them, we in effect become an accomplice to the crime, a partaker of their evil deeds. Whosoever transgresseth, and abideth not in the doctrine of Christ, hath not God. He that abideth in the doctrine of Christ, he hath both the Father and the Son. If there come any unto you, and bring not this doctrine, receive him not into your house [church fellowship] , neither bid him God speed: For he that biddeth him God speed is partaker of his evil deeds  (2John 9-11). We need to love one another in deed and in truth (1 John 3:18), but we are also told to speak that truth in love (Ephesians 4:15). Let us therefore have no fellowship with the unfruitful works of darkness, but rather reprove them (Ephesians 5:11). Let us be sober and vigilant, let us speak the things which become sound doctrine, let us earnestly contend for the faith. Let us not sleep as others do but let us watch and be sober. Holding fast the faithful word as he hath been taught, that he may be able by sound doctrine both to exhort and to convince the gainsayers. For there are many unruly and vain talkers and deceivers (Titus 1:9-10). Take heed unto thyself, and unto the doctrine; continue in them: for in doing this thou shalt both save thyself, and them that hear thee (1Timothy 4:16). After a day of exploring it was time for us to head home. When we were yet many miles from home and out on the open waters the transmission of our boat failed. The wind picked up and began to rock our boat. It was here that my daughter became fearful and began to weep. I found it a good opportunity to tell her how we must trust the Lord in all circumstances. If we have in our lives repent and believed the gospel, and by faith received Jesus as our personal Saviour we are saved from our sins. And if the Lord would allow our lives to perish, we would be in a far better place. and, lo, I am with you alway, even unto the end of the world (Matthew 28:18, 20). Although my wife had brought along our cellular phone, and we were able to call for a tow back to shore, this reminded me of just how easy it is to call upon our dear Lord when we need help. Let us therefore come boldly unto the throne of grace, that we may obtain mercy, and find grace to help in time of need (Hebrews 4:16). Safe they glided through the storm. Love not the world, neither the things that are in the world. If any man love the world, the love of the Father is not in him. For all that is in the world, the lust of the flesh, and the lust of the eyes, and the pride of life, is not of the Father, but is of the world. And the world passeth away, and the lust thereof: but he that doeth the will of God abideth for ever (1John 2:15-17). James 1:21 - receive with meekness the engrafted word, which is able to save your souls. (4) Holiness and obedience to leading of Spirit, walk by faith not by sight. Please preach the narrow way of obedience to God's word as the true way to salvation. Not everyone who says to me, 'Lord, Lord,' will enter the kingdom of heaven, but only the one who does the will of my Father who is in heaven. You are wrongly understanding the Scriptures. Your loss of salvation understanding stems from the teachings of Roman Catholicism and some of the Charismatic groups that are proliferating today. These are works based religious systems that will lead one down the broad road to destruction. You could never do anything to gain salvation, so what makes you think you can do anything keep it? Once you are born again and become a child of God, you can never loose your salvation. Salvation is of the Lord! You cannot be plucked out of His hand! Once a child of God, He deals with you as a child. If you sin, He will chasten you. If you persist in sin, He may even take you out of the world. While in the world, what you can loose is the joy of your salvation and your fellowship with Him and the saints. You may also suffer the loss of rewards, but salvation is not a reward, it is a gift. Jesus said, "I am the good shepherd" (John 10:11, 14). In the plainest of terms, He identified for them that He was the Great Shepherd of the sheep, and "is able also to save them to the uttermost that come unto God by him" (Hebrews 7:25). Jesus said, all that "cometh to me I will in no wise cast out... [and] I should lose nothing" (John 6:37-39). He said they, "shall never perish, neither shall any man pluck them out of my hand." Consider what the Psalmist said concerning Jehovah's sheep, "the LORD upholdeth him with his hand... and forsaketh not his saints; they are preserved for ever" (Psalm 37:23-28).